For Immediate Release: Posted On 6/28/2013 By Industrial Magnetics, Inc.
IMI is pleased to announce record lift magnet sales in 2013 across all lift magnet lines, including CreativeLifts™, PowerLifts®, BasicLifts™ and VersaLifts™. Top customers include fabricators, welding shops, steel service centers, heavy equipment & farm equipment manufacturers, the machine tool Industry and municipalities looking to easily lift manhole cover. Peter Friedrich, IMI’s Strategic Accounts Manager, credits their distributor network for their record gain, along with a broad product offering. "IMI is fortunate to have the best distributors representing our products, along with a lift magnet to fit every application - based on the features and price points the customer is looking for", states Friedrich. "Whether the customer needs a lift magnet that is always On or On/Off, or a model that can lift in both horizontal & vertical orientation, we can help them. Also, three of our 4 standard lift magnets are USA M.A.D.E. – a hot selling point in today’s market." IMI also offers a free plant audit program to assist customers with application assessment and product selection, ensuring the right magnet for the job. 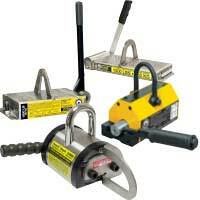 For more information on lift magnet products, call 231.582.3100 / 888.662.4638.